(Nanowerk News) As part of the National Research Program “Energy Turnaround” NRP 70 the Swiss National Science Foundation (SNSF) is supporting the interdisciplinary research project “THRIVE”. With IBM Research – Zurich and the Hochschule für Technik Rapperswil as leading houses, scientists from Empa, ETH Zurich, HEIG-VD and PSI will be teaming up with industrial partners until 2017 to develop a heat pump that is powered by waste heat. Compared to today’s compression heat pumps, this technology only requires very little electricity and can also use waste heat efficiently to air-condition buildings. The project is part of the SNSF initiative to support the Swiss government’s “Energy Strategy 2050” and is open to further industrial partners interested in collaborating. According to a study commissioned by the Swiss Federal Office of Energy (SFOE), heat production accounts for around half of Switzerland’s entire energy consumption, such as for heating or numerous technical procedures, including drying, forging or melting. Today, the energy demand is primarily covered by fossil energy sources and the waste heat produced in the process is usually released unused into the surroundings. Almost 40% of the total electricity consumption still goes on heating and cooling. The Energy Strategy 2050 plans to phase out nuclear power, which provides 40% of Switzerland’s electricity today, and to drastically reduce CO2 emissions – a goal that urgently requires the more efficient use of the available energy resources and a sustainable reduction in the electricity consumption. In order to make this possible, scientists involved in the THRIVE project (“thermally driven adsorption heat pumps for substitution of electricity and fossil fuels”) are investigating novel, so-called adsorption heat pumps. As heat is used to power these pumps instead of electricity, the technology could relieve the strain on the power grid on the one hand and harness heat from factories, power stations and computer centers or other renewable sources such as solar power, geothermics and biomass on the other. This would correspond to savings of around 1.8 million tons of CO2. Nowadays, heat pumps are mostly used to convert environmental heat, the temperature of which lies between -5 and 15°C, into thermal heat for rooms or processes. Traditional heat pumps draw warmth from the surroundings, such as from the earth or air, to vaporize a refrigerant in an evaporator. The vapor produced in the process rises into an electrically powered compressor, which condenses it and thus heats it up. The vapor turns back into liquid in an adjoining condenser and releases the heat into a heating cycle. This process can also be used to produce both heat to air-condition rooms and cool air, like in a refrigerator. The thermally powered adsorption heat pump works in a similar way – the major difference being that, in place of a compressor, it has an adsorption heat exchanger that uses heat at temperatures from 60°C as its driving energy instead of electricity. 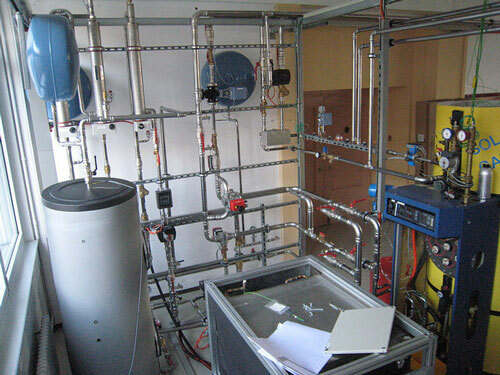 During the so-called adsorption process, the adsorption heat exchanger adsorbs considerable amounts of vapor from the evaporator and compresses it inside the heat exchanger, thereby releasing heat. The refrigerant adsorbed beforehand is forced (desorbed) back out of the adsorption heat exchanger by the supply of driving heat from an external source. The hot vapor released as a result turns back into liquid in the condenser and the corresponding condensation heat is released into the heating cycle. The adsorption heat pump can also heat and cool. As the cooling or heat production takes place intermittently, however, at least two adsorption heat exchangers working in parallel are needed for it to run uninterruptedly. Due to their low energy consumption, adsorption heat pumps achieve a much higher cooling or heat output in relation to the wattage used than conventional heat pumps. Moreover, pure water can be used as a coolant instead of refrigerants, which can sometimes be harmful for the environment. Another advantage of the technology is the fact that renewable heat sources can be used, such as solar-thermal systems, which typically generate temperatures of up to 90°C. By using heat, the adsorption heat pump is just the ticket for many interesting applications where conventional heat pumps don’t make any sense. It could, for instance, use the waste heat from future, actively cooled, concentrated photovoltaic plants or computer centers that are cooled with hot water to air-condition office or residential buildings. The Aquasar computer system developed by IBM researchers in collaboration with ETH Zurich is a pioneer of hot-water cooling for computer systems, which not only massively reduces the energy demand for cooling in computer centers, but also enables the use of waste heat. For the IBM researchers, THRIVE is the next step to make this a reality. Computer centers could then practically cool themselves using their own waste heat. ”In the THRIVE project, we have a unique opportunity to combine the latest findings from materials science, the technological optimization of heat exchangers and the merging of system and plant engineering from different disciplines,“ says Elimar Frank from the Hochschule für Technik Rapperswil and co-leader of the THRIVE project. In THRIVE, scientists and industrial partners are analyzing possible applications and market conditions for adsorption heat pumps in Switzerland and developing the necessary system and material technologies for future adsorption heat pumps. Scientists from Empa’s Laboratory for Building Energy Materials and Components, ETH Zurich’s Department of Materials and the Institute for Solar Technology at the Hochschule für Technik Rapperswil have teamed up with the materials suppliers Zeochem and MOF Technologies, and the manufacturer ETS Energie-Technik-Systeme to develop the sorption materials, heat exchangers and other components for a compact heat pump with a capacity of 10 kilowatts (kW) for cooling and 30 kW for heating. “By developing novel carbon and silicate-based adsorption materials, we can significantly increase their thermal energy density, which makes the system considerably more efficient and economical overall,” explains Empa researcher Matthias Koebel.